St. John's ace Ian Seymour helped the Pioneers sneak past the Eagles in Danvers. DANVERS - Once his teammates had staked him out to an early lead, Ian Seymour, the ace pitcher for St. John's (Shrewsbury), did the rest. Showing his appreciation, the senior flirted with a perfect game through the first four innings. A Virginia Tech commit, Seymour continued to mesmerize St. John's Prep with hardly any difficulty. Using his fastball, slider and change up effectively, the lefty held the Eagles to just three hits and struck out 10 on 88 pitches, leading the Pioneers to a 3-2 victory Monday afternoon at Brother Linus, C.F.X. Athletic Commons. "Ian pitched one heck of a game for us," said St. John's coach Charlie Eppinger. "Prep is a heck of a team year in and year out, and we have them on the schedule again next week. Our guys respect the hell of them and we are always mentally prepared whenever we face them." No doubt this triumph should put the Pioneers (13-2) into the driver's seat once the Super 8 pairings are announced early next month. St. John's has been on a roll of late, winning five straight while out-scoring the competition by a whopping 54-3 margin. The Pioneers built a 3-0 lead after the first three innings before the Eagles (10-5) rallied late, only to fall a run short by leaving the tying and winning runs on base. Benefiting from the early run support, Seymour continued to cut through Prep's line up with relative ease. Through four innings, the senior did not allow a hit or a walk. "I just buckled down and made the pitches that I needed to," Seymour said. "I was able to locate my fastball and my change up was really on today and my slider was there when I needed it. I try to pitch to contact but when you need a strike out I try to come up with one. My defense is really good behind me and made the plays today." Andrew Selima broke up Seymour's bid in the fifth by reaching on an infield single. The Pioneers got to Eagles starting pitcher, UConn-bound Jake Sanderson, in the second frame. Pat Galvin singled and Jake Hamel was given first following catcher's interference. Seymour helped his own cause by grounding a hard single up the middle that scored Galvin. The game plan for Prep coach Dan Letarte was to pitch Sanderson for two innings before going to his bullpen the rest of the way. 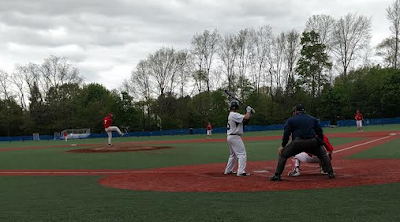 With Max Gieg now on the hill to begin the third, the sophomore ran into trouble immediately by walking Jack Gardner and Sean Burke before surrendering a single to Tom Moschella (2 hits), filling the bases with one out. A Joe Fields bouncer to third resulted in Gardner being thrown out at the plate. However, the Eagles could not avoid further trouble. Galvin, who also collected two hits, sent a ground ball deep into the hole at shortstop for an infield single which plated Burke. Chris Francoeur's toss over the first, in an attempt to nail Galvin, bounced away from first baseman Selima. That allowed Moschella to slide across the plate just ahead of the throw, giving the Pioneers their three-run cushion. But St. John's offense would grow cold soon thereafter. Relievers Dan Regan and Zach Begin combined to hold the Pioneers (7 hits total) to just one hit from the fifth inning on. St. John's did have a chance to extend the lead in its half of the fourth after putting runners on the corners with one out. But Burke grounded into a double play to curb the threat. Better late than never, Prep made things all the more interesting in the bottom of the seventh. A lead off single from Dan Frey was followed by an RBI double into the left-centerfield gap off the bat of Frank DiOrio. Two outs later, Alex Lane walked. Christian Kukas next hit a grounder to the right side that was stabbed by sprawling second baseman David Turco. However, the senior's throw to first forced Burke off of the bag resulting in DiOrio crossing the plate and cut the deficit to one. "Give Prep credit for not giving up," Eppinger said. "They had not done anything in the first six innings but then they put a bit of a scare into us in that seventh. Ian deserved this win today. I wish we had gotten some more runs for him but he did what he had to do out there. Getting those three runs early were very big for us. We just couldn't extend on it and sort of expected Ian to do the rest for us. Fortunately, he finished things off for us." Determined not to be denied, Seymour managed to cast aside any further drama by fanning Sam Blizard to end the game. "Hats off to Ian today," said Letarte. "He pitched a great game. We weren't able to touch him until that last inning. That was probably one of the best performances I have seen from an opposing pitcher in a long time. He works quick and pounds the strike zone."